The webworm, Hyphantria cunea (Drury), is a common pest of trees. It attacks more than 88 different kinds of plants, including many fruit, nut and ornamental trees and shrubs. It does not attack conifers (pines and other needle-bearing trees). 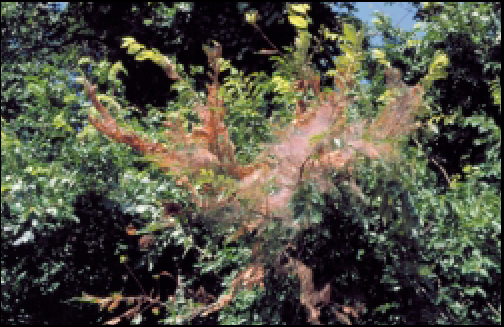 Webworms are known for the large, unsightly webs they produce. Heavy infestations are rarely fatal, but if they occur repeatedly over several years they can stress trees and make them more susceptible to drought, disease or other insect pests which can be fatal. The feeding preferences of webworms vary from one place to another. In west Texas, mulberry, poplar and willow are preferred; oak, hickory and pecan are most often attacked in east Texas. While Pecans are favored in the Texas Hill Country. The webworm moth is white and has a wing span of 1 to 11/2 inches. Sometimes there are small, dark spots on the forewings. Full-grown larvae are approximately 1 inch long, pale green or yellow, and covered with tufts of long, white and black hairs. There are two distinct races of the fall webworm, which can only be identified during the larval stage. Larvae in the orange race have orange heads and orange tubercles, while members of the black race have black heads and tubercles. Webworms often cover entire branches with their webs. In extreme infestations whole trees may be covered. Larvae feed within the web, eating the tender parts of leaves and leave the larger veins and midrib. There are two to four generations of webworms each year in Texas. Four generations occur in southern portions of the state, while two to three generations occur in the northern areas. The first generation occurs as early as April in south Texas and as late as June around Lubbock and Amarillo. The last generation of the year, which occurs in the fall, is usually the most damaging and gives the insect its name. Webworms overwinter as pupae on the ground or on rough tree bark. The moths emerge from silken cocoons in the spring to disperse and mate. Female moths deposit hair-covered egg masses on the undersides of the leaves of their food plants. An egg mass may be deposited in either a single or double layer and can contain up to 600 eggs. Each female moth will deposit only one egg mass. Egg masses of the walnut caterpillar, another common pest on pecans, are not covered with hairs. Soon after webworm eggs hatch the larvae begin to build a silk web. 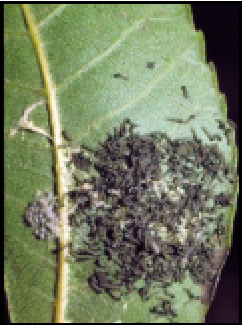 As larvae consume leaves within the web, they expand the web to take in more foliage. All larvae within a web are the offspring of a single egg mass. Larvae will molt six or seven times before leaving the webbing to pupate. The life cycle from egg to adult requires approximately 50 days. 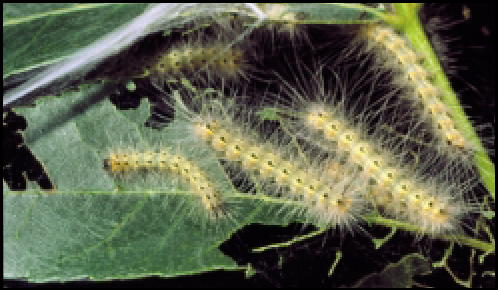 Webworms can often be controlled without insecticides by removing and destroying any leaves that contain egg masses. Larvae may be knocked out of low-hanging webs, with a stick or broom, and into a box or garbage bag for disposal. Or, webs can be pruned from smaller branches. 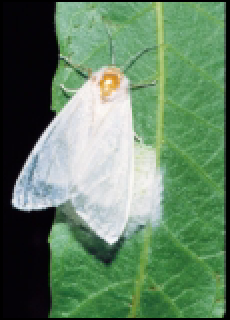 Many beneficial insects attack the egg and larval stages of fall webworm. You can help these predators and parasites get to their fall webworm prey by tearing open the webs. 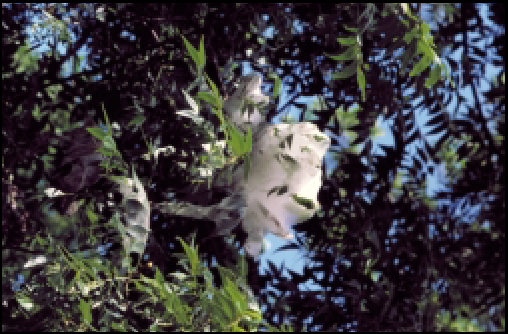 If webs are too numerous or too high in a tree to deal with individually, insecticides can be used to prevent damage. Hose-end sprayers or commercial high-pressure sprayers are best for reaching upper portions of tall trees. Because webworm larvae remain inside their webbing, insecticide sprays must penetrate the web to be effective. For best control, apply insecticides after eggs hatch and before larvae develop dense webs. Insecticides containing acephate (Orthene®), Bacillus thuringiensis (B.t. ), carbaryl (Sevin®), chlorpyrifos (Dursban®, Lorsban®), diazinon, malathion, and tebufenozide (Confirm® 2F) are effective. Insecticides containing B.T. and tebufenozide are selective for caterpillars and do not harm beneficial insects; however, they must be applied when caterpillars are small for effective control. Insecticide label clearances are subject to change and changes may have occurred since this publication was printed. The pesticide user is always responsible for the effects of pesticides on his or her own property, as well as problems caused by drift to other properties. Not all insecticides are registered for fall webworm on all sites and commodities. It is up to the user to read the label to make sure the insecticide is cleared for the site and commodity. Always read and follow carefully the instructions on the pesticide label.